For 36 years, a 70-foot statue has been trying to get up in the morning. Guess I’m not so slow after all. The Awakening is a 70-foot statue of a man trying to get up from the earth. There are five aluminum pieces in the ground with the left hand, right foot, bent left leg and knee, right arm and hand and his head showing. 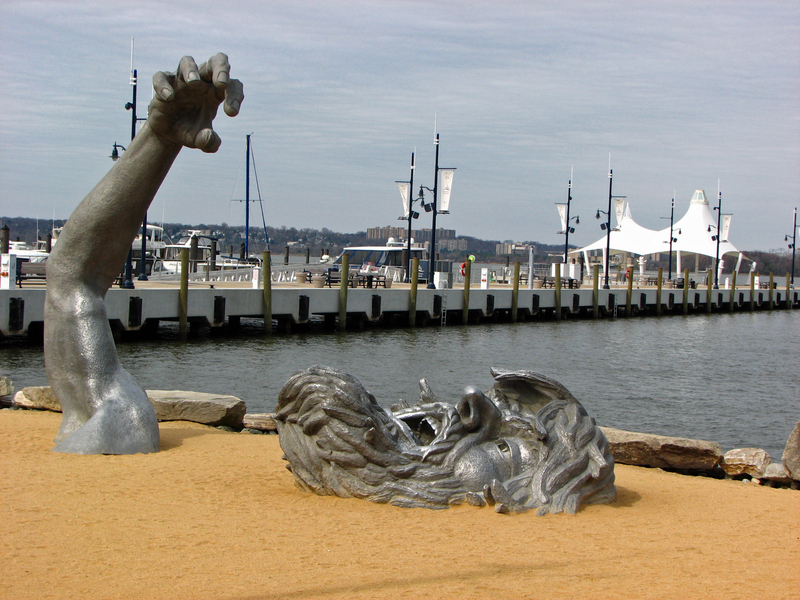 It was created by J. Seward Johnson, Jr. in 1980 at the southern end of Hains Point in Washington, D.C. across the Potomac River from National Airport. Johnson sold it to National Harbor in Oxon Hill, Md. in 2007 for $750,000. It’s closer together than the Hains Point version. Steps from the water, it’s a popular stop for tourists to climb on him. There’s also the nation’s only Peeps store just steps away. Check out the chocolate-covered peeps. This entry was posted in Attractions and tagged Best Washington DC walking tours, J. Seward Johnson, National Harbor, Oxon Hill Md., Peeps store, Photo by Lisa Snider, The Awakening sculpture. Bookmark the permalink.